The Philips Hue Bridge 2.0 is the bit of kit you absolutely must have if you want to get the most out of your Philips Hue lights – like actually being able to change their colours or set scenes. And right here we've got the best Philips Hue Bridge deals going right now during the Black Friday 2018 event. You can turn your lights on and off without the Bridge (using the Hue Dimmer Switch or even an Amazon Echo), but to do anything fancy you're going to want to get the Bridge. Given we've collected all the best Philips Hue Bridge 2.0 prices here for you, it's worth investing. The good news is you should only ever need one Bridge, as it can manage up to 50 separate lights. The less good news is that it needs a physical, wired connection to your router, so make room for it (and find another plug socket). 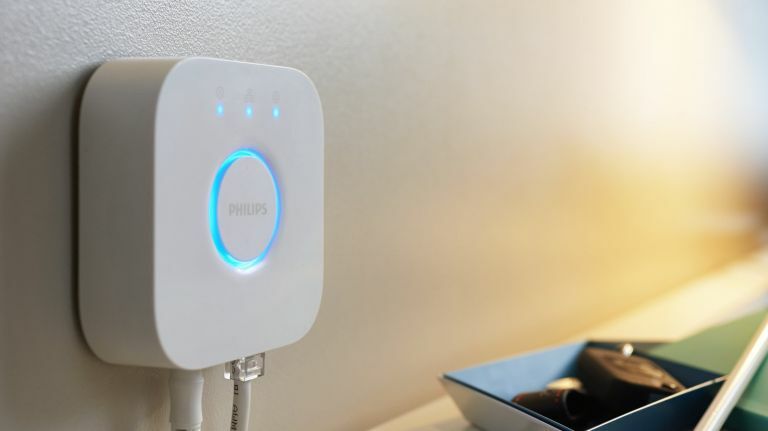 The Philips Hue Bridge 2.0 is basically is the brain that connects your bulbs to your home internet, so you can run through routines using an app on your smartphone or issue commands through something like a Google Home speaker. Change colours and shades with a tap, set timers and rolling colour cycles, have your bulbs interact with other devices like the Philips Hue Motion Sensor... it's all possible with a Philips Hue Bridge 2.0 attached. You can pick one up as part of a starter kit or buy it separately, and we've listed both options below. Whenever you add new apps or new gear to your Philips Hue setup, you'll be asked to physically push the button on the Philips Hue Bridge 2.0 – it confirms the connection and makes sure no one else is messing with your Hue smart lights. If you don't have any Hue bulbs yet, this is the cheapest Philips Hue Starter Kit and includes the Hue Bridge 2.0 and a pair of regular-sized white screw-in bulbs. You might also know them as E27 bulbs in the UK, or A19 / Edison bulbs in the US. Note that these are the most basic Philips Hue bulbs, without colour or 'temperature' changes, but still offering dimmer lighting, timers and remote switching (via smart devices). If you want to start off slow (and relatively cheap), the deals below are worth considering (as well as these other starter kit deals). With the Philips Hue Bridge 2.0 in place, you can then add more Hue bulbs as and when needed.